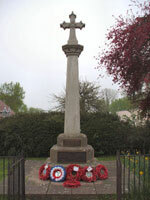 The list covers the First and Second World War and includes information from the Commonwealth War Graves Commission. Original listing and photograph courtesy of Alf Beard. HOPTON Charles William Sgt, 17627 7th Gloucestershire Regt died 17/8/1915 age 24. Son of John Charles & Annie of The Glebe, Twyning, Glos. Commemorated on the Helles Memorial, Turkey. HUTCHINGS Charles F 2nd Lt, Royal Garrison Artillery died 15/1/1919. Buried in St Nicholas Churchyard, Ashchurch Holder of the M.M. WITTS Arthur Pte 8112,1st Gloucestershire Regt killed in action, Wednesday 21 October 1914. Commemorated on the Menin Gate Memorial, Ypres, Belgium. Jesse Thomas Nind was born in Oxenton in 1885, son of Thomas Nind and Harriet nee Mustoe. Jesse enlisted into the 1/7th Battalion Worcestershire Regiment at Worcester giving his residence as Pershore.